Sigh. That fabric is gorgeous. Brandon likes to remind me that we already have a bench though. It was in the basement. You like that wrinkly rug? That was in the basement too. Eh. The only thing I like about that bench is the fact that it’s a bench (and can therefore add some much needed seating in our living room). I don’t like the legs, I don’t like the color, and I don’t like the overall shape. Still, in the spirit of frugality, I may try to make it work. 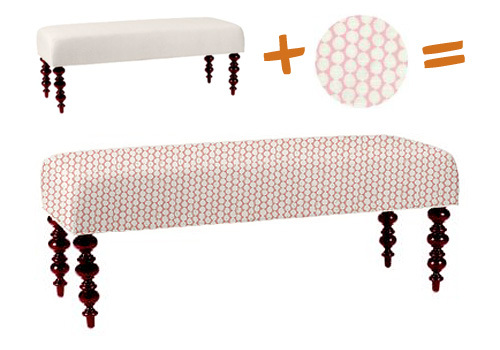 With spray painted legs and new fabric, maybe the bench could be cute? Possibly with some Amy Butler polka dot fabric? What if you sold the bench you have and used that money to put towards the new pretty bench? Yep, that’s a good option! I don’t know how much I can really get for it though. It’s from IKEA, and I think it was maybe $60 when it was brand new. I definitely think you can make it work, but I do reallllllyyyyyy love that second fabric. Maybe you can add a skirt to the bench to make the legs “diappear”?! You could alwasy remove those metal legs and replace them with wooden ones that you have painted. You can buy the legs at Lowes or any home improvement store. I love all your ideas and my daughter is always saying, “You like pink and brown, don’t you, mom?” Funny thing is you have so many things I do…uhhhhhhhhh except for kids…hmmmmmmmmmmm. Brown works with kids….pink not so much. You can borrow my 4 yr old son and my 15 yr old daughter if you’d like. They’re returnable (to me). My daughter never reallyyyyyy ruined anything, but my son has ruined some things in minutes that I’ve had for years….actually, lots of things…..and my husband, lovely hunk that he is has also ruined some things….expensive one’s too……..hmmmmm. One of these lives I guess I’ll just be single…as long as I remember, haha. Great blog, beautiful house….I like the bench you want. You could get at least 1/2 what you paid (haha, that’s shipping for your new bench). Then get in that basement and sell 10 more things for 20 bucks…..I’ll be checking you out daily, living vicariously…. reupholster the bench, sell it for more! its now a custom piece. then…. buy wonderful new one. i sort of think you have to. i love it. OK–I did a gravatar. Is it working? I think you should try to cover the legs with a skirt like Benita suggested. Not a ruffled, poofy skirt, though. I think something tailored would look best–like a bench cozy!–because as much as I like that bench, sometimes it reminds me of a pommel horse . I say take off the metal legs and replace them. You could find something in Lowes or HomeDepot. Then reappolster (sp) it. First, try to “make it lovely” -which you know you totally can, what about a box pleated skirt to cover the legs, and some really great pink and brown trim, you could use both fabulous fabrics and have one peaking out or make it reverseable for when your mood swings! I can see that you will love it and thank yourself for saving the extra dough in an IRA! Not only are you talented, but thrifty, after all, money can’t really buy that! Trust your inner self and make it lovely, then please show us! Currently, it reminds me of a gymnastics balance beam! Currently, it reminds me of a gymnastics balance beam! My first thoughts are to sew a slip cover that falls to the floor or sew one with a ruffle around it, or tiers of a few fabrics as a ruffle for ultra-girly cuteness. Obviously you didn’t need that bench as it was kept or stored in the basement. I mean, maybe you need a bench, but if you really liked that bench, you wouldn’t be looking at other benches. I’m a make-do or do-without kind of person as it is, but I don’t see that old bench in your home, changed legs or no unless you’re desperate for a bench. If you wanted to look at it, you wouldn’t have sent it to live in the basement. Yet I’m curious if and how it can be transformed cost-effectively to change my initial reaction. Yes, I think I’ll try to make a slipcover. I’m not going to make it out of the nice, expensive fabric though. 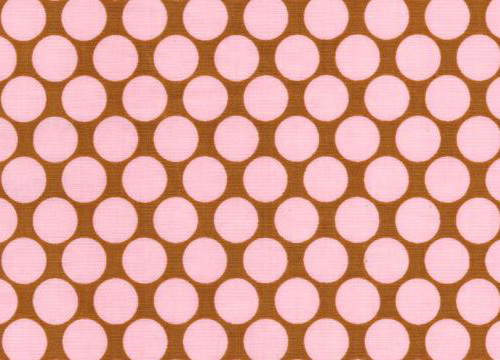 I’m thinking something in the less than $10 / yard range (like the Amy Butler polka dots). Something to the floor might be the way to go. I hate the proportions of the bench the way it is now. you’re warming my heart with all these kitties showing up in your photos! Could you just get new legs for the bench? Depending how crafty you want to get, attached is a link to a DIY table with legs that could easily be crafted for your current bench. Good luck. Yes, liking the slip cover idea to cover the legs. It really does look like a pummel horse, that’s funny. Also, I think you’re right on when it comes to your strategy with Brandon. If he sees you try to make the existing work then maybe he’ll acquiesce a little easier on another purchase should it not work out. Wifing takes skillz. 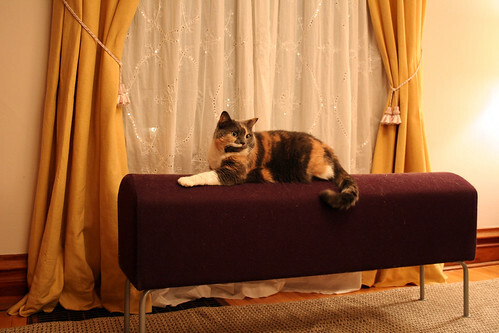 I actually made a bench similar to the Simone; and it cost about $50. Go to your local lumbar yard and have them cut a piece of plywood to your dimensions, and get four wood legs. Get a thick piece of foam from the fabric store; secure the foam to the plywood with spray adhesive. Cover foam with your choice of fabric and secure to the underneath side of the plywood with a staple gun. Drill in the four legs and you done! It’s super easy, really, I promise. I have the same ikea “pummel horse” in exactly the same color! It doesn’t go with anything in my house. I want to get rid of it. I LOVE the ballard ones, wow, $200 is a really good price. Hey Nicole! My favourite piece of decorating advice came from my father: “Hold out for the very best you can afford, even if it means saving for a while. It doesn’t matter what other people think; if you sell yourself short, you’ll always know it.” Take from that what you will; it guided me in the right direction a few times. That Amy Butler pink and brown fabric is adorable. I actually reupholstered a teak 1960s telephone table-seat in that very fabric (with you in mind! 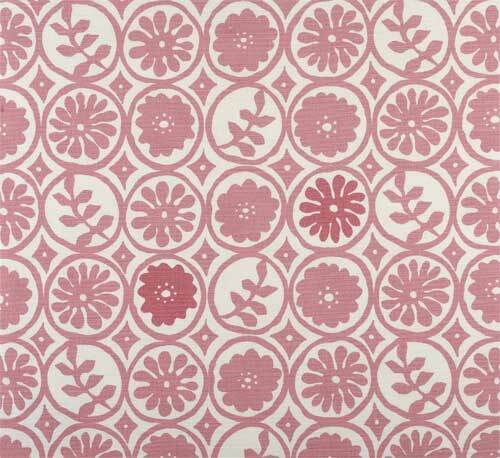 ), but unfortunately the fabric isn’t really suited for upholstery projects and I’m now on the hunt for something more heavy duty – in Ireland we have one remaining old school tweed mill and I hope I can get a soft pink fabric from them! Nicole, your dream bench is only $200. It’s on sale. Buy it. Congrats on the baby! She is sure to get your wonderful style!